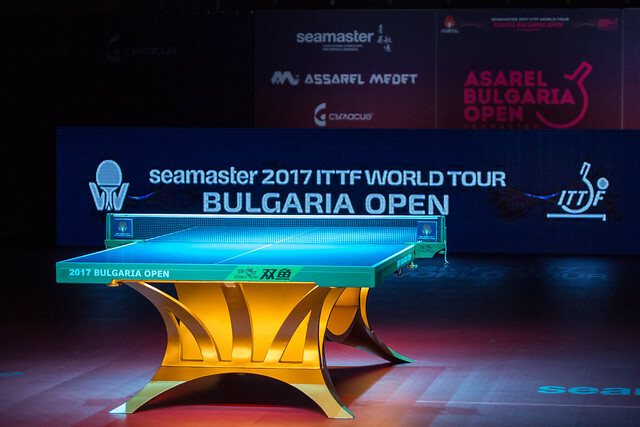 The Round of 32 of the Men's Singles competition drew to a close on Thursday 17th August, as eight players from the lower half of the field successfully extended their stay in the draw at the Seamaster 2017 ITTF World Tour Asarel Bulgaria Open. Belgium’s Cedric Nuytinck, who is seeded 12th, put in a strong showing in his opening Men’s Singles fixture in Panagyurishte against Chinese Taipei’s Hung Tzu-Hsiang. While the match was decided in five games both players fought at a high level, but only one competitor could emerge victorious and that turned out to be Nuytinck (11-9, 8-11, 11-7, 11-7, 11-8). However, Chinese Taipei will be represented in the Round of 16 after Peng Wang-Wei prevailed in his encounter with India’s Harmeet Desai. Seeded 11th for the tournament Desai was competing in his first Men’s Singles match at the 2017 Bulgaria Open, and the Indian player struggled to get up to speed in the tie as Peng ran away with a comfortable victory (3-11, 11-9, 4-11, 7-11, 8-11) to move through to the last 16. The remaining matches taking place in the lower half of the draw all produced positive outcomes for Japanese competitors. Kenji Matsudaira is one player who will be feeling very confident in his ability heading into the next round, following a fine performance from the Japanese contestant against the seeded Benedek Olah. In a thrilling end-to-end battle Matsudaira was pushed right to the limit but displayed an air of calm throughout the tie and eventually came out on top (11-5, 11-7, 8-11, 8-11, 11-9, 6-11, 11-7) eliminating his Finnish opponent in the process. Rightfully so Kenji Matsudaira will be delighted with his Round of 32 result but he will also be fully aware that he will have to be at his very best for his next fixture which sees him go head-to-head with Maharu Yoshimura, who saw off French player Enzo Angles in straight games (11-7, 11-9, 11-8, 11-9). Taku Takakiwa, Kenta Tazoe, Jin Ueda and Kenta Matsudaira were the other competitors to advance from the Round of 32.